If you read my posts on the Ruger 10/22 (part 1, part 2) that I set up for home defense, this post will contain echoes and similar logic to that series. That particular .22 now lives at my parent’s house as their home defense rifle. Since we had a gun-void, I sought to fill it. Find a carbine that my entire family could confidently use for self defense in the home, be willing to train with despite being recoil/muzzle blast-sensitive shooters, and keep at a reasonable cost. The ultimate goal is to build shooters with sufficient skill to make high pressure shots with no-shoots downrange on low probability targets. The only way to get there is if shooting isn’t a chore or abusive to the senses. Ammo costs and availability are a factor. We have a limited income, so a more affordable caliber makes sense for us. In my experience, less expensive caliber doesn’t mean spending less annually on ammunition, it means buying more ammo for the same price. More ammo means more practice, which means more proficiency. We also don’t have $1200 for an AR-15 pattern 9mm carbine. We have a cost ceiling that we need to stay under. I have a pile of Glock pistol magazines that largely go unused since I’ve switched to Double Action Pistols. Using Glock magazines would be a nice bonus to save on support gear. We have a time limitation. I need to maximize the training time, and blunt the learning curve by picking a platform that lends itself to quick proficiency. We rarely get time together, period. So finding time to go to the range is exceedingly rare. I have to strive for efficiency. Rifles are easier to shoot well. Four points of contact with a rifle beats two points of contact with a pistol. A red dot sight makes the learning curve easier for getting hits. For the shooters in my family, I need to be very considerate of recoil, and muzzle blast. My wife is quickly turned off to shooting a 5.56 rifle at indoor ranges due to the chest thumping concussion and flash that an AR-15 gives. She’s good for maybe 30 shots before she’s done. If concentration and focus is gone after one magazine, then competency will be impossible given the rarity of our range trips. My wife isn’t a shooter. She wants to understand and be able to run all of our guns, but she doesn’t love shooting like I do. I have to be considerate of her time and pick something that she might enjoy more than an AR or shotgun. I’d wager that many of you might be in a similar boat. It’s really time to bump the obsession with terminal ballistics down the list and keep context at the top. Despite what the ‘5.56 AR-15/ 00 buckshot or nothing’ crowd says, it’s more important that all the shooters meant to use a firearm can achieve a certain level of competency. If that means a .22LR, then that’s what it is. I wanted to give a 9mm carbine a chance, so here we are. This is the reason we want a rifle that anyone in the house can use. My greatest concern is the shooting problem of a home invader with a downrange no-shoot. Not that it needs saying, but in the real world, it is very likely that there will be no-shoots forward of the ‘180* range safety line’. In fact, it’s quite common in home invasions for a husband to answer the late-night knock on the door, only to be overrun by bad guys. If I’m downrange, I want to make sure my shooters are competent enough to shoot them well, and not shoot me. It’s a self-preservation thing. A struggle ensued, during which the homeowner was shot in the thigh by one of the suspects. The homeowner’s wife was at the front door to greet her husband, and saw the attack. She ran upstairs, got her handgun, opened the bedroom window and engaged the suspects with several shots from the window. She hit one suspect, and both fled. As the husband neared the front door, he heard the dogs growl and ran back to his bedroom, arming himself with a can of wasp spray, the records say. A man charged him in a hallway, and the husband sprayed the wasp spray in the intruder’s face, but it had no effect. “The fight was on,” the records say. Both men tumbled to the floor, and the wife ran out with a baseball bat and struck the intruder with it until it broke, according to the documents. These instances are not rare. That’s reason enough for me to want good shooters in the house. In 9mm. A caliber that all of my handguns shoot. I have plenty on hand, and one caliber streamlines things. It’s also the most affordable ‘duty round’ caliber. Easily takes an optic on the section of picatinny rail on top of the receiver. Takes Glock magazines. From 10-round to 33-round happy sticks. Similar ergonomics to the Ruger 10/22. The rifle that my wife has the most time on. Affordable. I got mine for $425 on Brownells. That’s extremely reasonable for a rifle. A section of rail that can be used for a weapon mounted light. I always try to have a light on long-gun. Next up will be some details on running it faster, optimizing the setup, and designing a training program. In the interest of practicing what I preach, as well as giving me something to do, I have decided to pick the ‘best’ carry pistol for me from my current small collection. This journey is mine alone, but I encourage you to think about what you value in a carry gun, do some research, and then shoot your short list side by side with a few drills that highlight the skills you’re likely to need. Rather than rely on changing fancies over different guns and brands, and to avoid the collector trap (which I can’t afford), I want to pin down what is ‘best’ based on actual numbers, and then go with that choice for a while. Like Chris at LuckyGunner, I’m going to start compiling my own scoreboard of guns by shooting the same few drills and getting comparison numbers. This is something I talked about in my youtube article. I’ve spent a lot of skull sweat weighing the relative importance of shooting the gun accurately, shooting the gun at speed, day to day handling, threat management, one handed manipulation ease, weight and carry comfort, concealability, magazine capacity, accessory and magazine cost and support, and company reputation. I’ve taken a honest hard look at the number of negative outcomes from things like NDs (negligent discharge) from sloppy administrative gun handling, trigger checking in high stress situations, sympathetic hand movement, and support gear failure/wardrobe malfunctions. It became apparent that I should acknowledge that I’m probably not as good as I think I am, and that leaning on a mechanical feature to add an extra layer of safety isn’t a sign of weakness. Here’s a short list of what I currently value in a carry gun, all things considered. Reliability. I use the ‘2000 round challenge‘ that TLG outlines. Though an initial 200-300 round break-in and subsequent testing with carry ammo is a good start down that road. No manual safeties. No extra buttons to get the gun into action. I’m not against guns with safeties, I just have chosen to go down the path buying guns without them. I like decocker only for DA/SA guns. Double Action Only. I was on a DA/SA kick with the Beretta PX4c, but I decided that I favor the shot-to-shot trigger consistency of a DAO. The long deliberate trigger press helps with people management and mitigates a few of the possible negligent situations mentioned above. I also feel like I pay more attention to my sights through the longer trigger press, which I realize is a personal problem. Claude has mentioned that this phenomena is not unique to me, however. Overall concealability for my current living situation and needs. I chose three drills. One is pure speed, one is pure accuracy, and the last is an integration of speed and accuracy at varying distances and is used by the LAPD. Claude Werner chose and modified the LAPD course to rank some guns and I glommed on with him. The Bill Drill from a Low Ready at 3 yards. 6 shots from a low ready on an target I can’t miss allows me to find my split-time/speed limit with that gun. The low ready starting point means I don’t have to have support gear for the gun I am testing and can shoot at a range where drawing from a holster isn’t allowed. 25 yard, 10 shots slow-fire on a B-8 bullseye, unsupported. Calculating the score. Pure accuracy. Sights and Trigger. (TacProf modified) LAPD Combat Course (Page 11 of this PDF). This one includes various ranges, par times, emergency and speed reloads, shooting from cover, drawing the gun, shooting from a low ready, target transitions, and some headshots. It’s a challenging course of fire that is scored for points, so there is some scoring resolution at the higher skill levels. Glock 19 (My ‘control’ firearm that I’ve carried for 9 years). Striker fired, 15 round magazine. .120″ Ameriglo fiber optic sights, 3.5# connector and 6# Trigger spring. 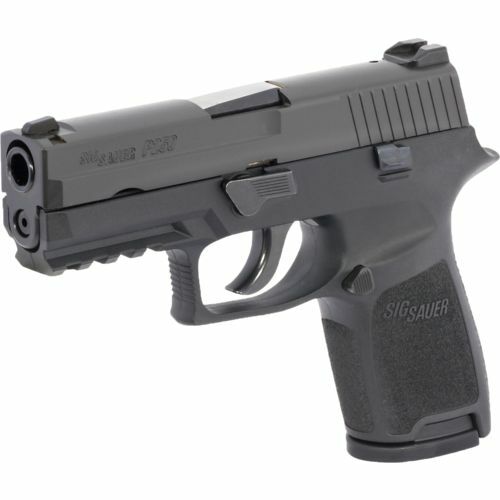 Sig Sauer P250 Compact with a medium-subcompact grip module. 12 round magazine. Double Action Only with a trigger like a smoothed out revolver. Ameriglo Orange front sight. H&K P30sk with V1 “Light LEM” trigger. This is my newest pistol. 10 round mag. Double action only. The LEM trigger has long light travel up until you get to a 6lb or so trigger break. It feels like a marriage of the weight of a Glock trigger with the trigger travel of the P250. L to R: P30sk 10 round, Sig P250 12 round, Glock 19 15 round. I don’t know how HK can’t fit 2 more rounds in their mag, but who am I to ask questions? Ammo: Freedom Munitions 124gn reloads. *I haven’t had an opportunity to shoot the LAPD combat course yet, but will add to the post when I do. I really don’t have a logical explanation for why I could shoot my new sub-kompact HK better than a pistol I exclusively shot and trained with for over 9 years. The only excuse I can think of is that I shot the Glock early in the session, and as I warmed up, my scores improved. Alternatively, I simply shoot this HK better than my G19. If I go strictly by the numbers, the HK gets the nod. If I go by what features I have the warm and fuzzies about, the Sig or HK get the nod. I’m glad my perceived needs aligned with my test scores. I’d admit that the results are close enough to probably not matter. It’s really a wash. I also realize I have a slow trigger finger. I’m also not a high volume shooter, with most of my practice coming in the form of dry-fire. Ultimately, my visual and mental processing speed and decision making ability will be the speed limit of my shooting, not the physical manipulation of the gun. As a result of my findings, I’ll be strapping on the P30sk in the morning for the foreseeable future. The Sig will get a X300U and a Safariland ALS Holster for House Gun Duty. The Glock19 will cry in the safe. I encourage you to do similar testing for yourself. You won’t know which of your guns you shoot best until you run the numbers. Don’t get married to specific gun based on ego, time invested, stubbornness, or blind trust in an instructor’s recommendation. Also, don’t change guns with the wind. Consistency and dedication to the grind is the key. Almost any gun will do, if you will. In an effort to put my money where my mouth is regarding moving to a defensive pistol that is ‘safer’ as a result of a longer trigger, I recently picked up a Sig P250 compact. My friend and the best shooter I know, K.C., recently got one as well, and I admit his purchase pushed me over the edge. Our philosophies on defensive guns are pretty well aligned, and I’m looking forward to seeing what he can accomplish with the gun. Author Tamara Keel also did some extensive testing with the .380 model. Article Here. I was able to find one at Academy Sports for $400 new. By all accounts, I got a pretty good deal on it. The upside to wanting a gun that no one else does is that you can buy them cheaper. It seemingly has everything I was looking for. My intention is to keep good range records and do a 2,000 round test, as my friend Todd Louis Green was fond of doing. My training volume is quite low at the moment, and this test could take a while. I’m OK with that. I will be doing range trips, some training, and some competition. I’ll report back as the round count grows. I also will try not to bore you with range trip reports, only when I reach significant round count milestones. I also do daily dry-fire practice, and I estimate the dryfire will in the 10’s of thousands by the time 2,000 real shots happen. It really does feel like a revolver trigger, but smoother and a bit lighter. I dig it. Factory sights are serviceable. I blacked out the rear white dots as they were overpowering the front spot during recoil. I’ll probably dab some orange paint to increase front sight visibility a bit more. My shot to shot split times on a piece of paper at 7 yards are about .10 slower than a striker fired gun. .34 seconds or so. I’m not a fast or talented shooter. I’m willing to trade .10 seconds for the peace of mind that I get from the longer trigger. I also am willing to put in the extra work that a longer DAO trigger demands for proficiency. The daily dryfire of my J-Frame is paying dividends here, though the Sig’s trigger is much smoother and lighter than my snub. I seem to actually be MORE accurate with a double action trigger. 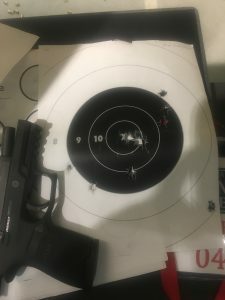 I feel like I pay more attention to the sights during the trigger press and I have been getting a very clear read on my sights during the shot cycle. Claude (The Tactical Professor) told me that he has noticed the same thing. NRA Marksmanship Qualification Program (qualified Distinguished Expert), the 100% accuracy standard over 220 rounds is what makes this one tricky. I encourage you to try it. 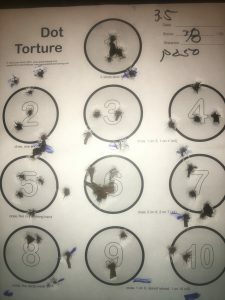 Dot Torture – Got a 38/50 today at 4yds. Lots of room for improvement. Managing the new trigger and having patience on target transitions and after reloads. 3×5 card walkback drills – made it to 16 yards, starting at 4 yds in 2 yd increments. 2 and 4 shot rapid fire strings on full sheet of copy paper at 7 yds to work on tracking the front sight and working the trigger smoothly.